The National Oceanic and Atmospheric Administration (NOAA) sponsors a program that could be very helpful for farmers. The Community Collaborative Rain, Hail and Snow Network (CoCoRaHS) is a web based network of people all over America that voluntarily report daily precipitation (rainfall) through a website portal. Yes, it is the longest acronym in the history of mankind. 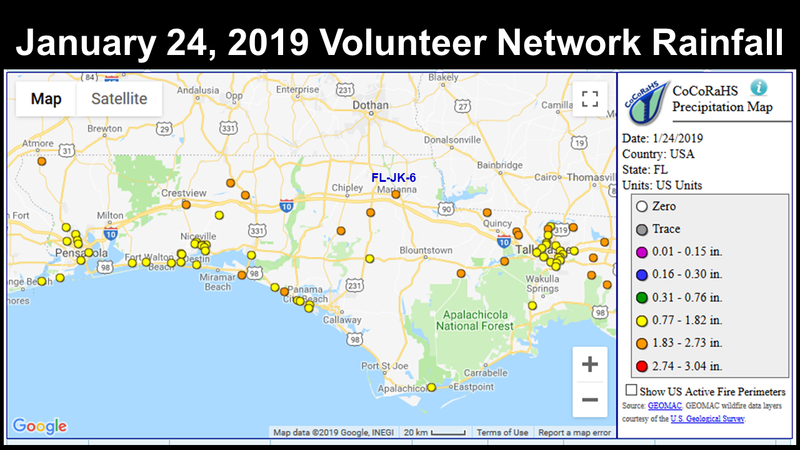 I have joined this network and have been submitting rainfall data since November as FL-JK-6. Instead of maintaining a written record, or trying to keep up with a spreadsheet, the NOAA website software provides a summary for me that is easily accessible. In return, the National Weather Service has has more data to verify impacts of storms, than just their standard weather stations. We all know the frustration of receiving much different rainfall amounts than what is reported from larger cities in the area. With the CoCoRaHS system, you can track your site-specific rainfall just by entering the data from your gauge into an app your smart phone in a matter of seconds. There is no fee for participating in this program. The only requirements for participating are that you report rainfall at a consistent period every day (7:00 AM is what is recommended), and that you purchase a $32 high capacity OFFICIAL COCORAHS 4″ RAIN GAUGE for each location reported in this network. There is an option for multiple-day reporting, for periods when you are away from your gauge for multiple days. I checked with the local CoCoRaHS program coordinator, and it is possible for farmer or rancher to report from more than one location. However, each rain gauge would be required to have its own unique account and password. My suggestion, if you are interested in participating, is to start with one account at your home or farm headquarters, and then see if you would want to add other locations later. So what does this have to do with farming? There are several reasons that participating in this program could be of great benefit to farmers and ranchers. Using the CoCoRaHS website or phone app greatly simplifies keeping rainfall records, and the only expense are the high capacity rain gauges, which won’t over flow. I would suggest ordering one of these even if you don’t participate in the CoCoRaHS program, just because it will not overflow if you get more than 6″ of rainfall at a time. There is real value in having a database of multiple years of rainfall records kept at no charge on the Internet with relatively easy access. 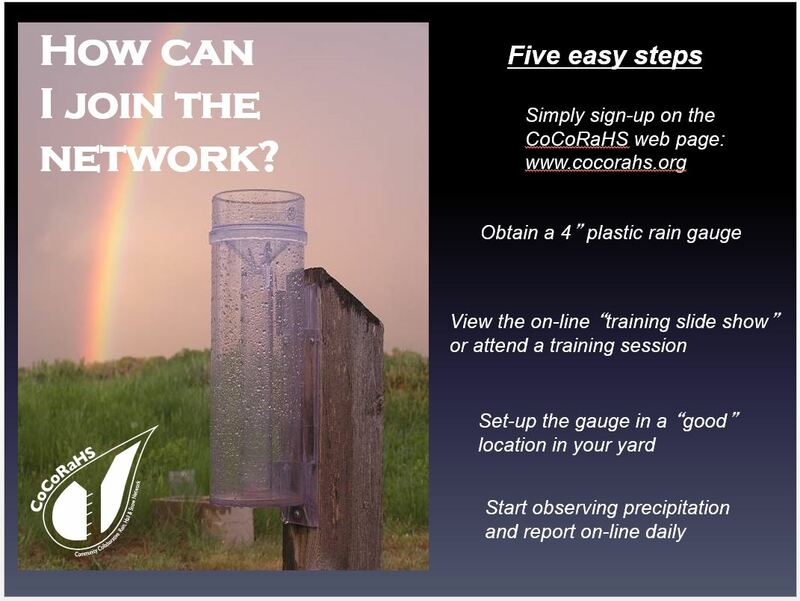 Perhaps the greatest benefit for becoming a voluntary CoCoRaHS member is that rainfall data is entered each day in a matter of seconds, but can be accessed for each location or by county. The software keeps track of your rainfall for you, and can be accessed for specific periods of time. Below is an example of the sort of data available for each weather station or by county to compare with other locations nearby. Currently there are three people that are actively submitting data from Jackson County in the network. You can access this data using the Total Precipitation Summary, and setting the time frame and county you want to look at data for. 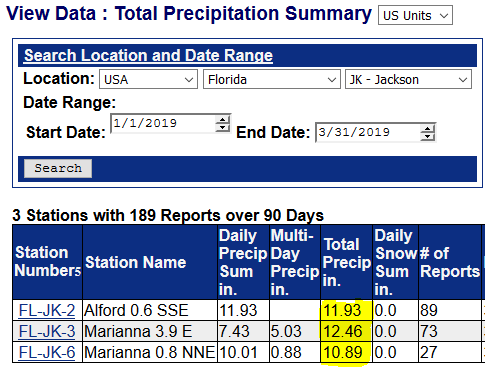 Below is the total rainfall received at the three stations in Jackson County so far in 2019. In 2018, these stations received over 24″ through the first quarter of the year, as compared to the 11-12″ this year. Currently we have rainfall data from several sources including the Florida Automated Weather Network (FAWN), airports, the Florida Forest Service, and local military bases. But it is valuable to have access to more records for a given area. No one knows who is reporting the data, only the physical location of the rain gauge, but it is very helpful to see the range in rainfall, especially in the summer when there is so much variation from location to location. Below is an example from January 24 of the sort of data available each day in graphic format. You will notice there is a significant void of data in the farming regions of the Panhandle. Through out my career, there have been multiple occasions when farmers have needed rainfall data for reports or issues they dealt with. Whether you need to justify irrigation use from the Water Management District, to settle a dispute with crop insurance, or to share with a seed company for a refund on seed with poor germination, it is good to have documentation to prove the amount of rainfall received at your farm. This systems makes it automated, and does the math for you. The CoCoRaHS website gives you access to your data fairly easily through the Station Precipitation Summary Report. 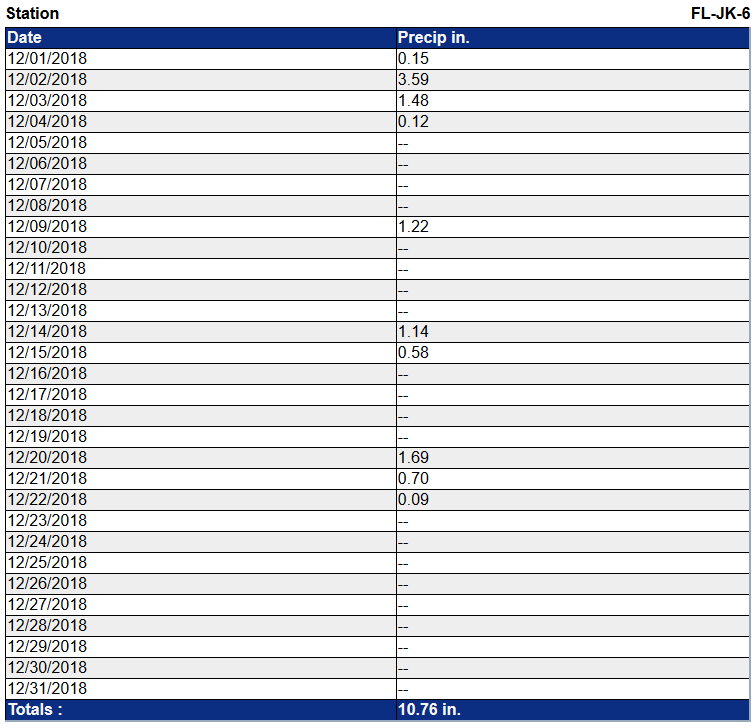 In the example below, you can see that I collected a total of 10.79″ in December, and the specific days I recorded rain. With or without irrigation, the amount of rainfall received plays a huge role in successful crop and forage production. While the amount of rain you recieve is totally out of your control, it is helpful to compare production with a rainfall history from year to year. While we can certainly get data from the FAWN system, these stations may be located some distance away from your individual operation. With the data summary from your own gauge, you can easily compare rainfall history at your own location. Go to the CoCoRaHS website to read more details about this program, starting with the About Us link. 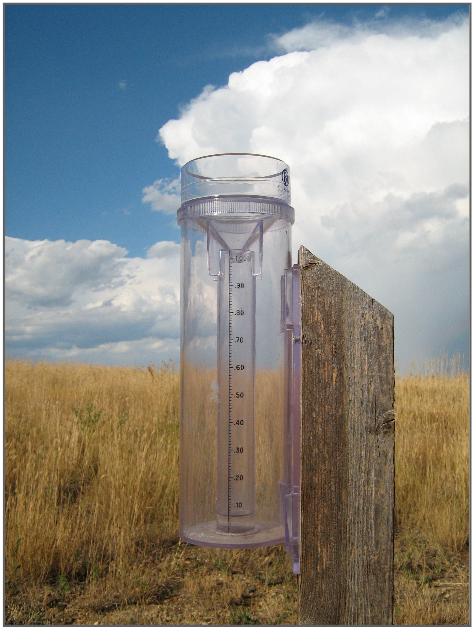 Order an approved rain gauge and mount it on a 4″x4″ post (or two by fours screwed together) away from buildings or trees, but in a location that you can easily access every day. Complete the application to become a CoCoRaHS Volunteer Observer and wait for the email to provide further instructions. Start reporting your rainfall through the CoCoRaHs online data entry portal. You don’t have to report every single day, if there was no rainfall, but they would like you to. Sometimes seeing where it did not rain is also helpful. They would also like for you to report rainfall each morning at a consistent time, such as 7:00 AM local time, but it does not have to be exact, if you sleep in a little on Sundays. They main thing is that you have a single entry for each day. I really enjoy this program, as it gives me quick access to daily rainfall totals across Northwest Florida. I hope you will start contributing as well, so we can get more data flowing into the system from the rural areas of the Panhandle.